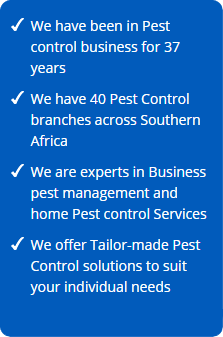 Besides rendering specialised pest control services as outlined in point 3 above to many satisfied domestic clients, the West Coast franchise also services commercial and industrial clients such as: several SPAR & Pick ‘n Pay outlets, restaurants, business offices, Hospital, clinics, government buildings and premises, fisheries, fishing vessels, Country Estates, Golf Estates, factories, fruit & horse farms, commercial retail stores, Tronox (Namakwa Sands), several contractors inside Arcelor Mittal (Saldanha Steel) i.e. PPC Cement, several Transnet divisions, Oil & Gas Industry, etc. The West Coast branch also specialises in solving the ‘out of ordinary’ pest challenges: certified to work with high heights, licensed to perform bird-culling of nuisance birds and delivering pest control services for mining & industrial plants which requires all-inclusive safety files for each site. The supply of Hygiene equipment forms a large part of our hygiene products such as Fragrance Air Fresheners, Soap Dispensers, Hand Driers, She-bins, toilet paper, Jumbo Decca rolls & stands, Anti-Microbial & Anti-bacterial Hand Liquid Soap, Colour-coded cleaning equipment, Disinfectant products for food safety, Degreasers, to name but only a few. 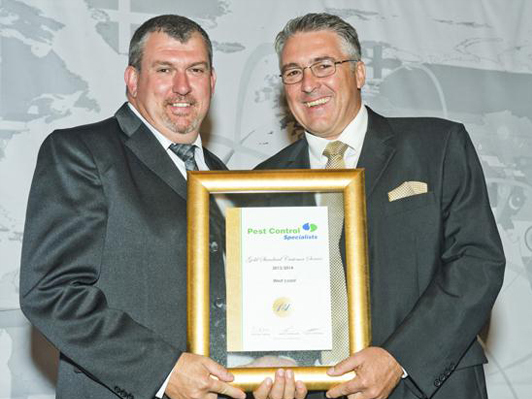 Johan & Annie Reynecke opened the doors of Pest Control Specialists – West Coast franchise on 1st February 2010. The dedicated owners and team have grown this business from zero clients to an average growth of 20.4% per annum for the last 7 years and have a meaningful track-record of satisfied commercial, industrial and domestic clients in the West Coast, who benefit from our services.  This business has been recognized in the West Coast with several meaningful awards for outstanding services rendered. 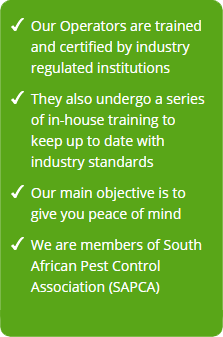 Our membership with the South African Pest Control Association (SAPCA) underlines the fact that we comply with industry standards. Our trained Pest Control operators and our remedies are registered with the Department of Agriculture, Act 36/1947. We are registered on online tender and verification platforms such as CSD (Central Supplier Database), WCDB (Western Cape Data Base) and SCNET (Supply Chain Network), etc. Our services support a HACCP (Hazard Analysis at Critical Control Point) plan for FOOD SAFETY in food environments. We only utilise products which are SANS approved. Our Public Liability insurance is covering up to R10 million. This branch is situated ‘on your doorstep’ (in Vredenburg) which enables us to render prompt, friendly and professional services to you and the whole of West Coast which would simplify and speed up the service delivering process to you. 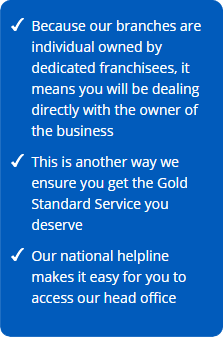 We are just a friendly phone call away. The entire West Coast Area from Yzerfontein | Darling | Malmesbury up with the N7 to Clan William through to Lamberts bay. Due to the fact that there is no franchise covering the area South from the Namibian border, the West Coast team have the authorization to deliver specialised services right up further North to just before the border. Pest Control Specialists in the West Coast are an industry leader in providing environmentally safe, reliable and superior services in order to protect our customer’s health, food and property. Trusted and Recommended since 1978.